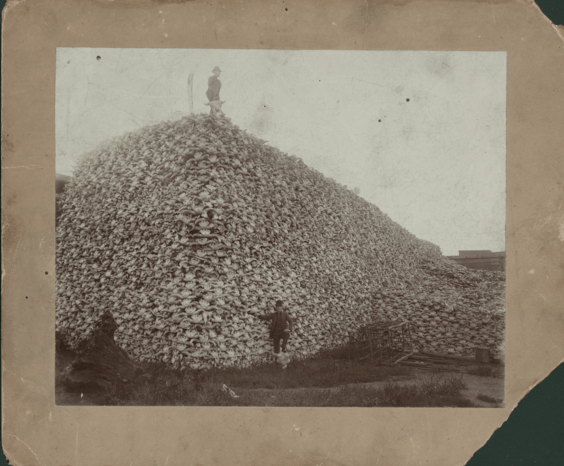 A photo, which purportedly shows a man standing on top of a large pile of bison skulls, is real. A photograph shows a man standing on top of a pile of bison skulls. Is this real american bison skulls? Homesteaders collected bones from carcasses left by hunters. Bison bones were used in refining sugar, and in making fertilizer and fine bone china. Bison bones brought from $2.50 to $15.00 a ton. Based on an average price of $8 per ton they brought 2.5 million dollars into Kansas alone between 1868 and 1881. Assuming that about 100 skeletons were required to make one ton of bones, this represented the remains of more than 31 million bison. The quote accompanying the photo is also real, although it wasn’t originally attached to the photo of bison skulls; it originally appeared in the 1983 book Spires of Form: Glimpses of Evolution by American biologist Victor Scheffer.